Jason Moore (6 years ago) Inappropriate? Very nice model of the La-5! 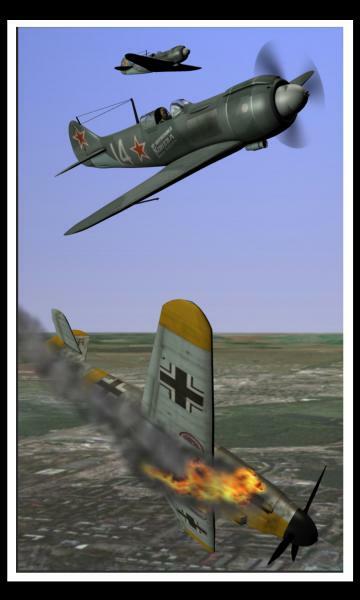 I don't know about an La-5 shooting down an Me-262, markes, but three times Hero of the Soviet Ivan Mykytovich Kozhedub shot down an Me-262 in an La-7, a development of the La-5 and one of the best low-to-medium altitude fighters of the war. He was the top Allied ace with 62 confirmed kills (he almost certainly had more). The Me-262 was not damaged until more …Very nice model of the La-5! markes (6 years ago) Inappropriate? About a LA-5 to shoot down a ME-262... well it should have been either a badly damaged ME-262 or a quite unexperienced german pilot otherwise it would have been no match, mate. BusterBoy (7 years ago) Inappropriate? Cool model, but how do I import it with the texture into 3ds max? Very nice! Semyon Lavochkin would be proud. Thank you. ekatz (7 years ago) Inappropriate? yes, this definitely flys well in the flight sim. very agile with lots of grunt. thanks for all the holidat gifts. Steelrazer (7 years ago) Inappropriate? Totally cool surprise, Neil! Thank you. It is great to find something else under the tree besides pine needles and ripped up wrapping paper when you take the tree down. We don't have enough Soviet warbirds, but you're certainly taking care of that, eh? Thanks, mate. Way cool. Thanks and Happy New Year! One of my favorite Soviet WWII aircraft, another great job from Neil.